Our traditionally made gelati and sorbets are made with recipes dating to 1895. Over a 100 years of experience rooted in one of Italy’s greatest traditions: this is what has made Milano Gelati synonymous with successful gelati and sorbet desserts all over Australia. Milano Gelati has taken the tradition of this generous, historic city and turned the rich fruits of its earth into a series of little masterpieces made with professionals in the sector in mind. Innovation and creativity ensures Milano Gelati products are always perfectly able to meet the quality demands of both the food industry and the end consumer. An efficient sales network with excellent coverage guarantees a reliable consulting and assistance service. Chef Franco Negri was born and raised in hills surrounding Lake Como, a lake of glacial origin in Lombardy, Italy. There, Franco built a solid foundation on which to begin his career. He was an apprentice to Maestro Gelatiere Carlo Pozzi a master in pastry and gelati in Milan. In 2002, Franco and wife Camilla moved to Queensland and gaining formative experience in making superb gelati with locally sourced produce. 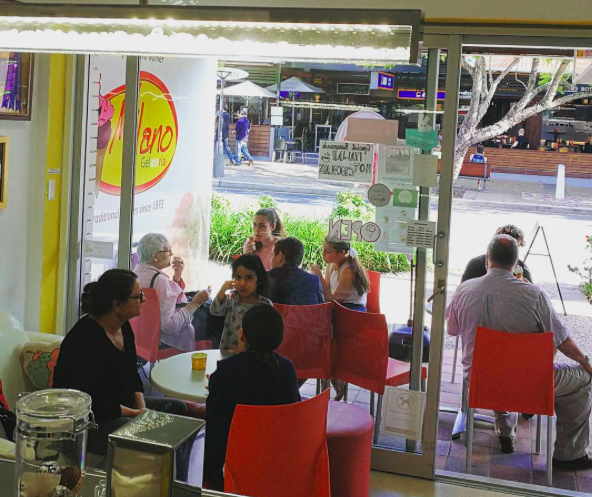 Bringing Gelato tradition to warm sunny Queensland. A Masterchef with impressive technical knowledge and artistic talent in the area of chilled desserts and gelati. He combines inspiring tradition with superb creative skill bringing a fresh twist to the classics. With total dedication and a passion for his work, he combines inspiring tradition with superb creative skill in the sphere of chilled desserts and gelati. He displays outstanding talent for bringing a fresh twist to tradition. We make our Italian ice creams and sorbets from scratch, using only the best quality ingredients, following recipes dating back to 1985. Winners of many awards, including Best Ice Cream in Queensland in 2009 and 2010, we also offer a wide variety of dairy free and gluten free choices. We offer many other treats, including Italian hot chocolate, coffees, affogato and ice cream cakes made to order. Come and enjoy real Gelati!